The city of Toyama, which borders the East Sea on the western coast of central Japan, has historically been known for its pharmaceutical industry. Among the many shops that gave the city its fame throughout the Edo era and beyond, the most popular was Ikedaya Yasubei. It is in fact the only remaining medicine shop that still employs the traditional methods of drug preparation. Toyama’s reputation started circa 1690, when the “Hangontan” medicine became widely known in neighboring regions as an effective cure for colic. Umeken use some of the greatest production methods in the world to continue Toyama’s legacy of creating high quality health products. In fact, just getting into the factory itself requires a great amount of care and attention. Masks, hoods, and a full-body hygienic suit are standard procedure, along with meticulous cleaning of shoes and clothing. Hands must be washed twice with two different types of soap, and then disinfected with an alcohol-based sanitizer. Finally, an air-shower system removes any remaining dust or foreign particles on the body prior to entering the facilities. The Umeken factory does not look like a typical factory. Rather than a large warehouse, it consists of many smaller rooms where each Umeken product is developed in isolation, with strict temperature and humidity control to provide the best environment for each product and process. Let’s take a closer look at the production process of Umeken’s fl agship product - Plum Extract Ball. The first step in production is to measure out the ingredients after they have been hygienically brought into the factory. It is extremely important to have accurate quantities of each ingredient before moving forward. Of course, among the many ingredients, the plum extract is the most important. Made by simmering down the pressed juices from the hard, unripe green plum, the plum extract retains all of the nutrients and benefi ts of the plum, but at 50 times the concentration. This is truly the essence of the product. After combining this and the other ingredients into a thick dough, the mixture is made into a ball form using an innovative process, which captures the essence of ancient traditional methods of making medicine, but allows for automation and mass production. This process has been recognized by top industry experts in Japan as one of the best production techniques in Japanese pharmaceuticals, helping create the small, easy to swallow pills that Umeken is proud to call its fl agship product – the Umeken Plum Extract Ball. To keep the finished pills from sticking together, they are placed on a rotary dryer until they are fully dried. Afterwards, they go through several rounds of filtering systems to ensure consistent size and shape. The first round of filtering helps sort out any misshapen or deformed pills. The second round of filtering removes any pills that are not the right size. Finally, the remaining pills go through manual inspection from a team of trained staff who filter out any remaining pills that are not in satisfactory condition. The final step, filling the pills into each container, goes through the same meticulous care and precision as all of the others. All of the equipment is carefully checked for proper function on a regular basis, and of course is kept in a completely hygienic environment. The containers are packaged with genuine care that represents Umeken’s heart of passion and gratitude toward its customers. Umeken started as a pharmaceutical company in 1947, was officially rebranded in 1978 as Umeken, and today continues to work out of its factory in Toyama and HQ in Osaka, with an R&D (Research and Development) Team that includes experts from various fields. 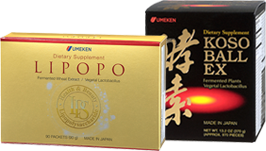 With superior quality and production methods, Umeken currently produces and distributes over 1,000 different health products to its customers across the globe. However, one thing we must always remember that even with the best techniques and recipes, you cannot create a high quality health product without high quality ingredients. Tamura Tomoyuki, Director of Quality Control at Umeken and Dr. Kawahara Tayeko give us a better look at the quality of the ingredients in Umeken’s products. “It may seem obvious, but above all, Umeken considers safety its number one priority. The very first step in production is to thoroughly inspect all ingredients brought to the factory to make sure no substandard materials are allowed to aff ect the quality and safety of the end product. The next most important thing is the actual product process, and great care is put into constantly testing the eff ectiveness of the each step of combining the materials into the final product. We believe quality is a commitment, so we continue to research, with the help of Japanese university professors, more ways that can help improve the eff ectiveness of our products and ensure that we continue to have consistent results. Let’s take a look at the farms on Miyakojima where some of Umeken’s ingredients are grown. Miyakojima is one of the Okinawa Islands, which are considered one of the cleanest environments in the world with its low levels of pollution. However, even among these islands, Miyakojima is considered to be truly spotless. Miyakojima is so beautiful, that just being there makes you feel healthier. Nutrient-rich soil, warm sun, and clean air help grow the finest ingredients for Umeken products. Here we meet the Umeken Farm Manager, Tahera Katsuhiro. "We directly manage the farms at Okinawa here at Umeken. At these farms, we grow more than 10 diff erent types of crops. Most notably, there are bidens pilosa and purple turmeric. Many health food companies use contract manufacturers to produce their products. However, Umeken oversees the entire development of the product from point of origin to customer distribution, even to the point of growing its own ingredients here at the Okinawa farms. This is the level of Umeken’s commitment to quality assurance. For those of you who have been loyal customers of Umeken for the past 20 years, we want to thank you from the bottom of our hearts. There are a little over 300 employees here at Umeken, and all of us have one passion, to continue to bring you the best and most trusted health products in the world." Today, we took a look at Umeken factories in Toyama and farms in Okinawa. Both of these locations value people over profits, and work to represent the heart of the medicine peddler that has been immortalized in the statue at Toyama station. By growing their own clean, quality ingredients and using superior production techniques, Umeken is able to provide products you can trust. Umeken will continue in the commitment to keeping a clean environment that provides high quality organic ingredients that keep you and your family healthy not just today, but for many years to come.